A team of cosmologists is creating an enormous map of how dark matter is distributed across the Universe—and this is the first section to be completed. The map was presented yesterday at a meeting of the American Physical Society by researchers from the Swiss Federal Institute of Technology in Zurich. It’s been acquired using a 570-megapixel camera in the Victor M. Blanco telescope, located at the Cerro Tololo Inter-American Observatory in Chile. That was used to gather accurate photographs of around two millions galaxies in the southern sky. From there, the team measured subtle distortions in the images due to a phenomenon known as gravitational lensing. The gravitational force exerted by large objects is enough to bend light subtly. If we know what’s between a source of light and the point from which we’re observing it—which, in the case of galaxies, we do—we can predict how much light should be bent. Any discrepancies can be attributed to the presence of dark matter. 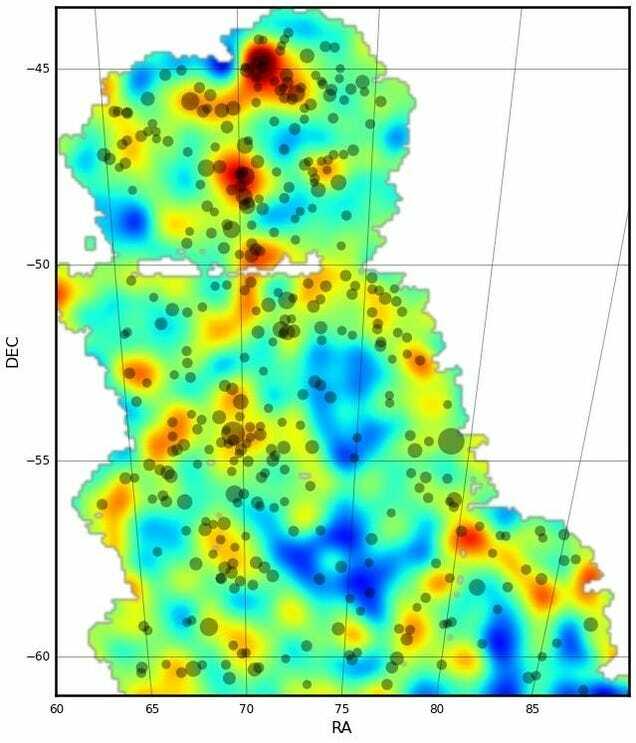 The resulting map, shown in full below, shows the distribution of dark matter between Earth and the observed galaxies.Voids show up in blue; super clusters of dark matter are red. But while the map is impressive, it’s actually very small indeed compared to the size of the Universe. While two million galaxies sounds like a large mass of data, the patch the map covers accounts for the equivalent 700 Sun areas as seen from Earth—or just 3 per cent of the Universe.